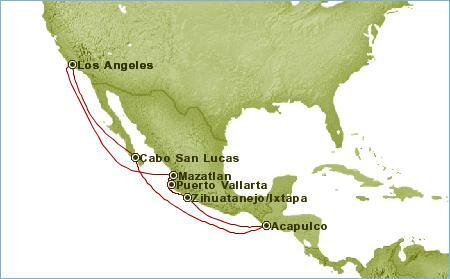 We are back from our ten day cruise along western Mexico, we were gone from March 26th through April 5th, 2003. We cruised on the Sun Princess. 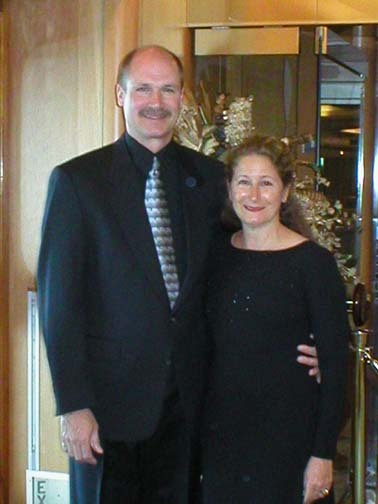 The package we booked was through Cruise Connections in Vancouver, British Columbia. 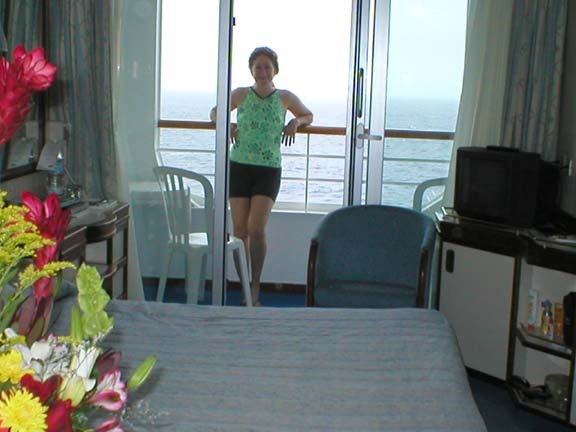 This was the first cruise we booked a balcony (183 sq. ft. with balcony), we thought since it had four sea days, it might be good to have our own space to relax outside. It wasn't the largest but good enough for two chairs and a small round table. The nicest thing about having a balcony was leaving the door open to hear the water, getting fresh air, and a good view. I will give a day by day breakdown of what we did, saw and at the end tips for anyone else doing this itinerary. Since we only had one day per island, we didn't have enough time to get to know them well. Our son, Sooner dropped us off at the new Northwest terminal at Metro Detroit Airport at 6:00 in the morning. We wanted extra time due to expecting extra security because of the war with Saddam Hussein (Iraq). Our flight left on time at 9:07. 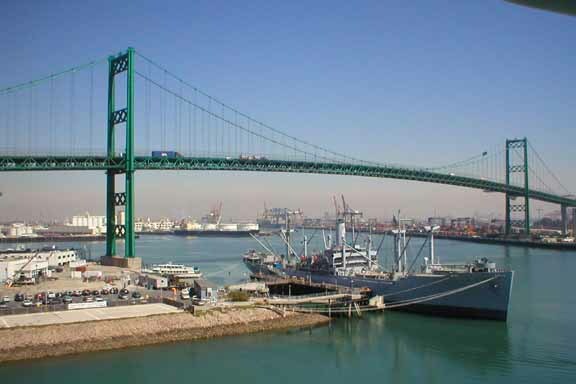 We rented a car from Enterprise and drove to our hotel in San Pedro, a Holiday Inn ($90 with tax). 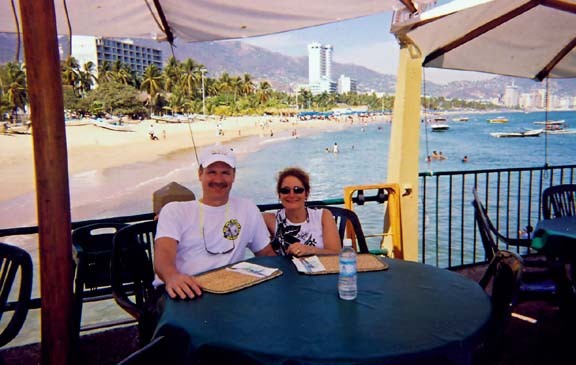 We ate lunch at the Green Onion which was ok, and at night had happy hour at the Acapulco Restaurant by the water. The hotel was ok, but later we found out a better one would have been the Hilton in Cabrillos Marina which was on the water. We found it while we were sight seeing and stopped for a buffet breakfast on Wednesday. While we were sightseeing we stopped at a park, and the Korean Friendship Bell. After eating at the buffet ($10 each) and walking around the marina, we dropped off our car and they dropped us off at the ship. We were able to board at noon and the check-in was easy and uneventful. After getting settled in (A607, Aloha, deck 11) and exploring the ship we ate in the Horizon Court Restaurant (deck 14) which is open 24 hours a day. They had prime rib and lamb chops the first night! Temperature was 62-70 degrees. The first day aboard we got up and exercised, trying to burn some of the calories we knew we were adding. 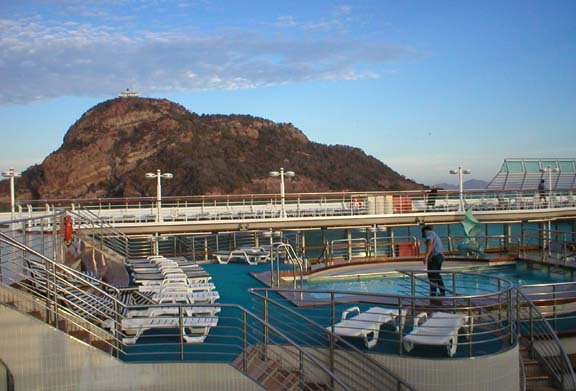 Three times around the Promenade deck (deck 7) equals one mile. I saw a whale in the distance while going around. It is the end of the season for whale watching as they are starting to head north. There is also treadmills, weight and elliptical machines, etc. on deck 14 aft. The weather was nice enough to lay out on deck 14 or 15. At dinner it was formal night and we were eating in the Marquis Dining Room (deck 5) which was personal choice dining, which meant you didn't have an assigned dinner time unless you called to make reservations. We prefer the freedom to go whenever we want, and hardly ever had to wait. We watched a comedian (Big Daddy) the first night in the Vista lounge. 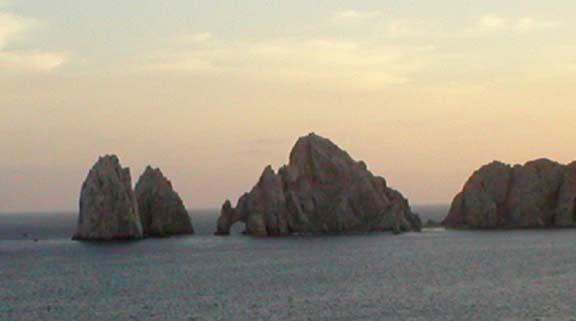 We booked the Princess cabo san lucas certified scuba dive excursion. It took one hour to get to shore because of the tender lineup. The dive operation was Diversions and the cost was $81 including all the equipment. What we didn't know was the water temperature was 66 degrees and the visibility was only about 20 feet. We had to put on full farmer John wet suits, I got a 3 mill suit and Lynn got a five mill suit. They gave me 25 pounds of weight which turned out about right, but after three tries had Lynn up to 25 pounds and she still wasn't sinking. She decided to snorkel after seeing the conditions and a group of five of us dove, including the divemaster. We dove to about 70 feet on two different dives. I saw blue and orange angels, tangs with black strips, black puffers with white spots, a lot of five armed star fish, one scorpion fish?, and a lot of moorish idols. If I had known the conditions, I probably wouldn't have planned diving in March. 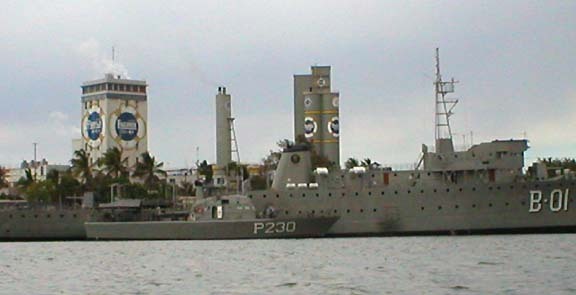 Cabo was a scenic port but with diving and tendering we didn't have time to explore. The population is approximately 40,000. The weather was nice so we laid out some. I watched a little of the art auction. Pancakes, bagel & lox plus a lot more for breakfast. At lunch the highlight was a good italian ice cream called Cuippe Inglaise that tasted like egg nog but also had chocolate chips. At night I had escargo, french onion soup, caesar salad and a lobster pasta (sounds like we ate a lot, huh?). We watched a russian born pianist (Dmitri) at 8:30 and a singer (Karen Saunders) at 10:30. We didn't make plans for Acapulco. When we got off the boat we started walking and had a man who said he worked for the government lead us to the flea market. My impressions were that a lot of the streets needed cleaning and the guide although nice, was probably taking us to where he could make a finders fee. 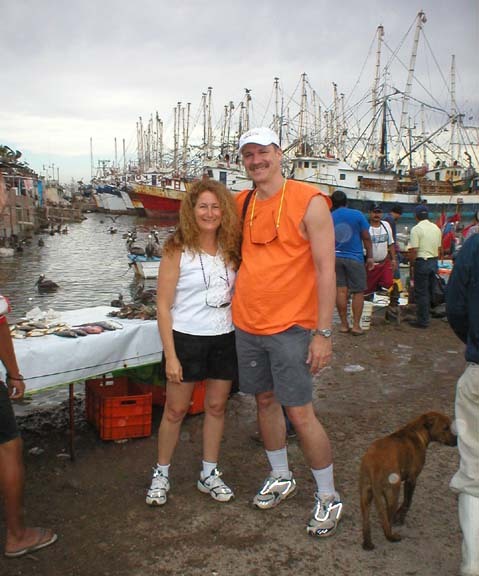 After looking around the flea market and being unimpressed we walked back toward the ship and Lynn started a mission to find some chili rellenos. Another guide gave us some information as to where he thought we could get chile rellenos and where he was unsure of. I was taking the information with a grain of salt, but we followed his advise to get a taxi to the restaurant Rest El Zorrito (Fox). I asked him how much before getting in, he asked the taxi driver and then told us $8 (I don't think the driver spoke english and we don't speak spanish), I acted like that was too much and he said we could offer him less, I offered $5 and the deal was done. As we got in the taxi, I saw the driver slip our guide some pesos, (a commission made). Lunch at the restaurant Rest El Zorrito (Fox) was downtown across the street from the beach. I think it was El Morro Beach. Lynn loved the chili rellenos and said they were some of the hottest she has had. I had fajaitas and we had some coronas, all for less than $30 including tip. From there we stopped in a few stores and crossed the street to the beach. The temperature was about 86 degrees and we kept our sandals on because the sand was hot unless wet by the water. 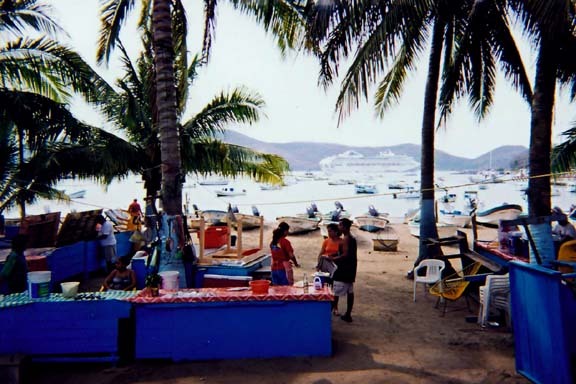 We walked back to the ship on the beach, with a lot of happy mexicans swimming away, about a 2 mile walk, it was nice. Just before the ship we stopped for a couple of fruit drinks at Cafe Del Mar 100% Natural and a bowl of guacamole for Lynn. 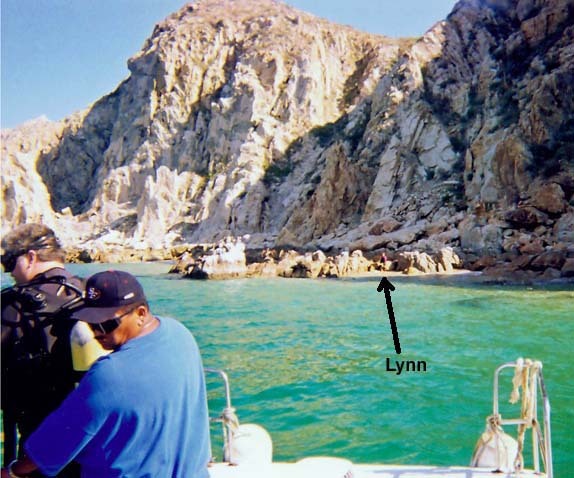 After a nice break I knocked over my drink and spilled on Lynn; so off to the boat to freshen up, lucky it was close. After cleaning up we went across the street to a liquor shop (La Divina) that had some good prices on kahlua and chocolate liquor. We heard the cliff divers were only about one mile up the street and worth while if you went early and watched the boats, people massing for the show, and young divers practicing. Most tours showed up just in time for the divers and a half hour show and left. The city has approximately 3.2 million people and in general didn't impress us although we didn't see much of it. We heard that Mexicans only have to go through school until the eighth grade and then can drop out; also that only 25% of the population graduates high school. We got up had breakfast and then took the tender to Zihuatanejo. 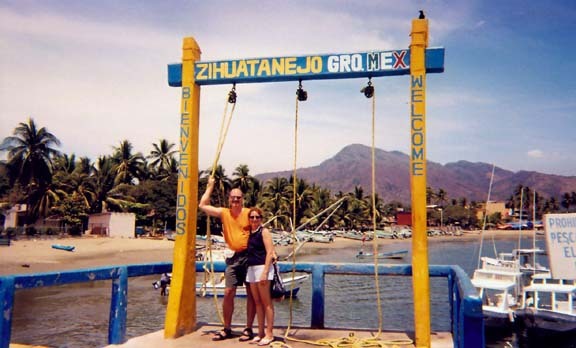 You could go to Ixtapa about 4 miles away but we stayed in Zihautenejo. It was probably our favorite stop. There were a lot of small shops conveniently located with reasonable prices. We decided to do some pre-holiday and birthday shopping and picked up some nice gifts. We found a nice shop called La Zapoteca and Gal Lupita we liked the most. I can't tell you what we bought here and now because I might give away a surprise. The temperature was from of 80-90 degrees, and felt good. After shopping we stopped in a little cafe by the beach and Lynn tried another chili rellenos while I tried another corona or two. 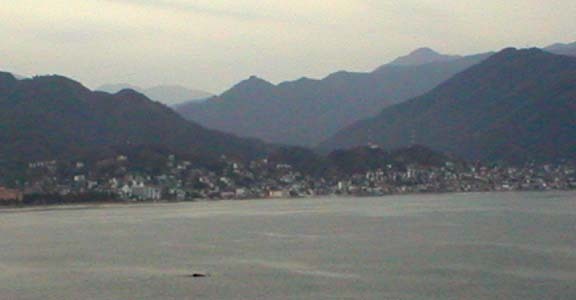 The total population of Zihuatenejo is approximately 40,000. As we sailed in we saw a whale swimming by. We had pre-reserved a snorkel and kayak package at Marietas Island through Princess so we tendered to shore and got on another boat. We thought you went to a beach and the activities were from there, but it turned out you were based on the boat all except 1 hour on the beach. It was a 1 hour 25 minute boat ride to the snorkeling by the island, then we snorkeled for about 20 minutes and they saw some small jellyfish so we moved to another spot about 15 minutes away and snorkeled for about 1 hour. The visability was not good and the water temperature was cool. After that we had lunch on the boat, Lynn was feeling sea sick after all this time. Although not sick she didn't feel like eating. We finally went to a beach and stayed there for about an hour before getting back on the boat for another hour ride back. The crew of the boat was great, just not the excursion we expected or hoped for. Once back by the boat (about 4:00), we stopped by a couple shops close to the tender. They seemed to have some good prices but Lynn still wasn't feeling herself so we went back to the ship. I can't tell you much about this stop except the population is approximately 250,000. 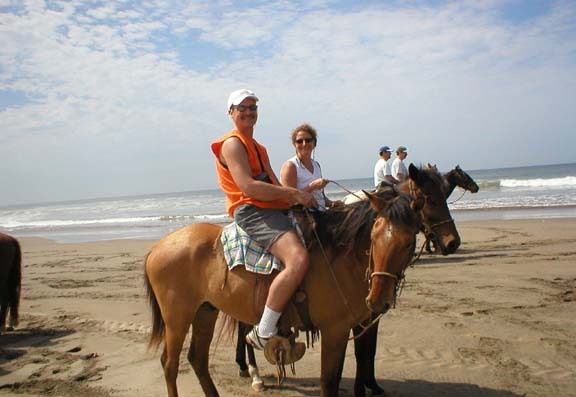 We independently booked horse back riding called Randi's Happy Horses. When we got off the boat and we were met by Randi and then went to the market by the exit to wait for the other riders. After a little shopping (the prices seemed higher), everyone showed up, so we got in the back of a covered pickup and rode to a little marina. From there we got in a small boat for a five minute ride to the penninsula, got in a wagon pulled by a tractor and went to the horses. I was put on a large horse called Flea and Lynn got one called Konaho. The ride was nice through coconut, lime and mango plantations. We then went down a undeveloped beach to Victor's Restaurant and had a cold beer, chips & salsa, and a garlic shrimp lunch. 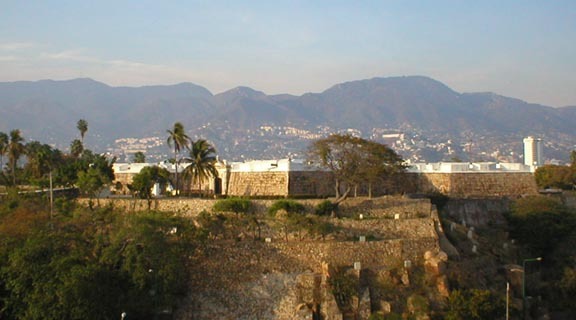 Mazatlan is the largest exporter of shrimp, the season was over when we were there, but they also have farm raised. At night we watched a show called America's Music in the Princess Theater. We worked out again. The temperature outside dropped to 68 degrees and had a stiff wind so we stayed inside. Lobster and Beef Wellington was some of the dinner choices. They had a champagne waterfall with some dancing afterwards (about midnight). Temperatures were from 61-56 degrees with a strong breeze. We worked out again packed, rested and ate, ate, ate. 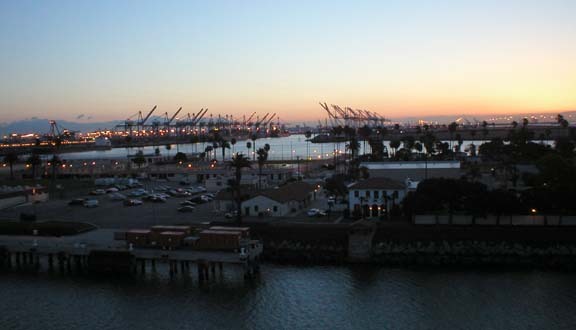 We were in port by 6:00 and were suppose to go to the Vista Lounge to go through immigration by 6:30. We went to the lounge at 6:15 and the line went from one end of the ship to the other, poor planning on someone's part. We waited in line for 15 minutes and it didn't move so we went up and had breakfast. After breakfast we got back in line, it was longer still, but at least moving and after 30 minutes of line shuffling, got our stamp on our customs form. We took a service to the airport and waitlisted on an earlier nonstop flight. Our karma was good as we got on and also were put in first class, a nice way to come home. Since we were early we took a cab home ($60) and were back by 9:00pm. The water temperature is suppose to be in the 80's in October. The visibility is suppose to be good in November. So for scuba diving, I would go in November. We were buying silver bracelets (.925 silver) and necklaces for about 8 pesos per gram. My wife bought a necklace and bracelet that weighed 50 grams for $40. The dollar was worth 10.50 pesos. Art Auctions on board had many good deals if you want to buy some framed artwork. The prices were probably less than half of what it would cost you in galleries, and insured shipping was $60 at most. There were washers and dryers on the Sun, so you could pack lighter and do a couple loads of laundry in the middle of the week. The cost was only $1 to buy the soap. Recommended tips for the Princess staff were $3.50 for the room steward and $6.50 for the meal staff; per person, per day. So our tips for two for our ten day cruise were $200. I usually have to get a souvenir shirt, so I can always plan I need to pack one less. Bring old underwear and socks so you can throw them away when they get dirty. You might even pack cloths you don't want any more so you can give them away or throw them out to lighten the load as you go. On this cruise you could buy liquor and bring it on the boat, the last cruise we were on, a Norwegian Cruise they would keep it until the end of the cruise. One thing Norwegian did that was better, was give picture deals at the end of the cruise, Princess didn't give package deals so they were more expensive. The clientele was older, probably because it was a longer cruise and left mid-week.